This is a continuation of my last post on corporate sponsorship in our schools. If you haven’t had a chance to read yet, it’s located here. Rep. Irv Slosberg of Boca Raton, Florida, the sponsor of one of those two bills that would allow corporate advertising in schools said that he would prefer to see someone like Whole Foods or Publix in the mix. He went on to say that companies he would prefer not to get naming rights included Coca-Cola and others that market sugary beverages, including soda, sports drinks, and energy drinks. He noted that some research links such beverages to childhood obesity. Slosberg asserts that many kids don’t eat right. He suggests that the object is to teach them how to eat correctly and nutritionally. It’s unknown how much revenue selling the naming rights could raise. School bus advertising, however, could raise about $2000-$5000 per bus. He said that in Duval County (the Jacksonville area) that would be about $2.5 million school bus advertising. Slosberg plans to ask State Sen. Steve Wise, R-Jacksonville, to guide the measure through the Senate. Although supportive of the idea, Wise said it’s too late to introduce a separate Senate version of Slosberg’s house measure. Wise said that we could tack it onto the bus bill or another bill. Slosberg also had filed bills that would allow the state to sell naming rights to its trails, parks, and greenways. If passed, the cafeteria naming rights bill would take effect July 1, 2012. 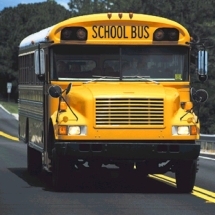 In 2002, then-Rep. Mike Haridopoulos, R-Melbourne, sponsored a bill that would clear the way for cash-strapped school districts to raise money by allowing companies to advertise on school buses. In my next post, I’d like to share with you what Tonya thinks are tacky ideas as well as my take on this whole matter.